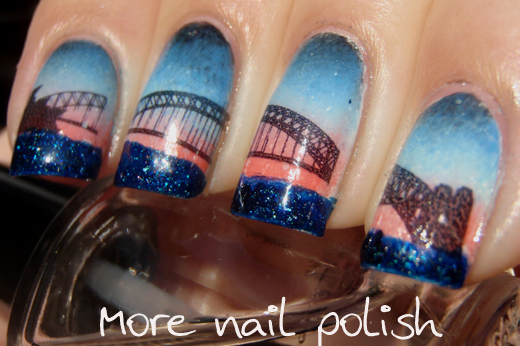 For day three of my Aussie Nails extravaganza, I bring you Australia's iconic Opera House and the Sydney Harbour Bridge. For this mani, I first created the gradient background using dark blue, light blue and coral pink polishes, over a white base. 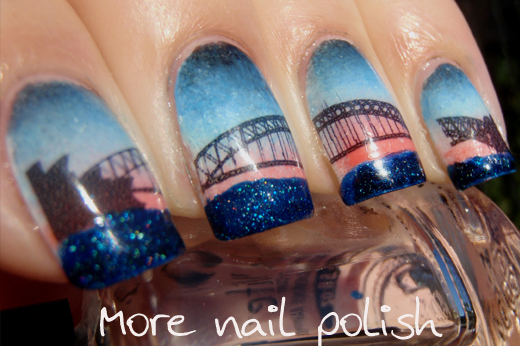 I then applied my print at home temporary tattoos of the silhouette of the Opera House and the Harbour Bridge. Each image on my nail repeats part of the design from the nails either side. 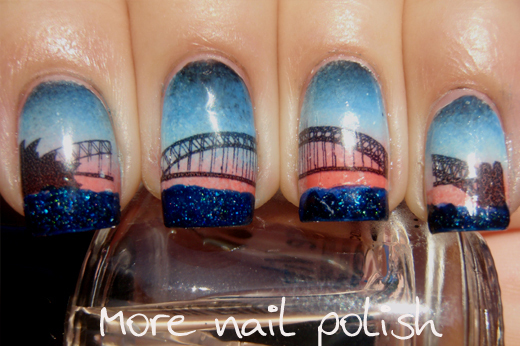 I find I need to do this because my nails are very curved and if I don't, you don't get the full effect. 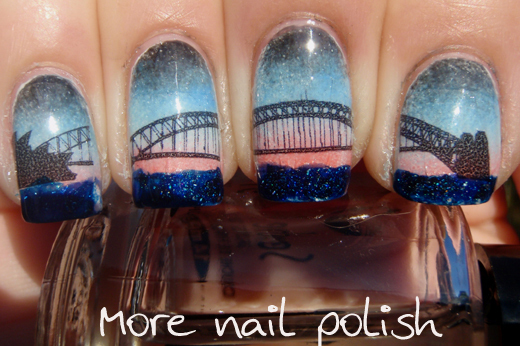 Lastly I applied Picture Polish Cosmos as the sparkling water beneath the bridge. I deliberately made the finish on the water uneven to represent the undulating water. All sealed in with a coat of Seche Vite. This mani was one of the longest I've ever endured. To complete both hands it took me 1 hour and 20 minutes! Mind you I did end up having to completely redo my middle finger after applying the wrong tattoo image to it and wondering why it looked so weird! I'm sure I don't need to say how happy I was with the finished look. It was so pretty from a distance with the combinations of the blue and coral tones, but then so detailed up close for when anyone wanted to see what was on my nails. Also, I have to add that climbing the Sydney Harbour Bridge is an absolute must do for anyone that ever visits Sydney. We did it back in 2006 at it was a wonderful experience. You walk up the stairs that traverse the left side of the bridge all the way to the very centre at the top. You then cross over the middle at the top to come back down the same side of the bridge, but the other side of the road. For once I was really happy how my right hand turned out too. Here is a rare photo of it. I don't usually show my right hand because my damn index finger is always short and stumpy! 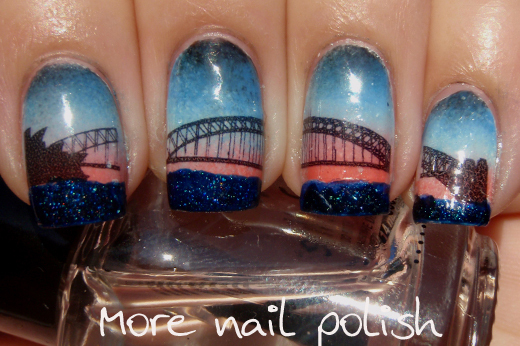 I love these Cathy, by far and away my favourite of your Aussie nails. I am biased though as I used to work at Bridgeclimb so I have a special fondness for the SHB. I was there back in 2006 so I may have even met you! oh wow, you are so clever!! My god these look beautiful. Very clever and eye catching! Breathtaking! Every time your designs are more and more beautiful! Do you have a tutorial about making tattoos for nails? Wow! This came out fab! I am amazed at the detail you got here. How original! Color choices are great! Wow, those tattoos are great :D! This is totally amazing !!!! I'm speechless, this is AMAZING! This is breathtaking! It conjured the same feeling I have looking at the Opera House and the Harbour Bridge at dusk on the ferry. You're amazing!